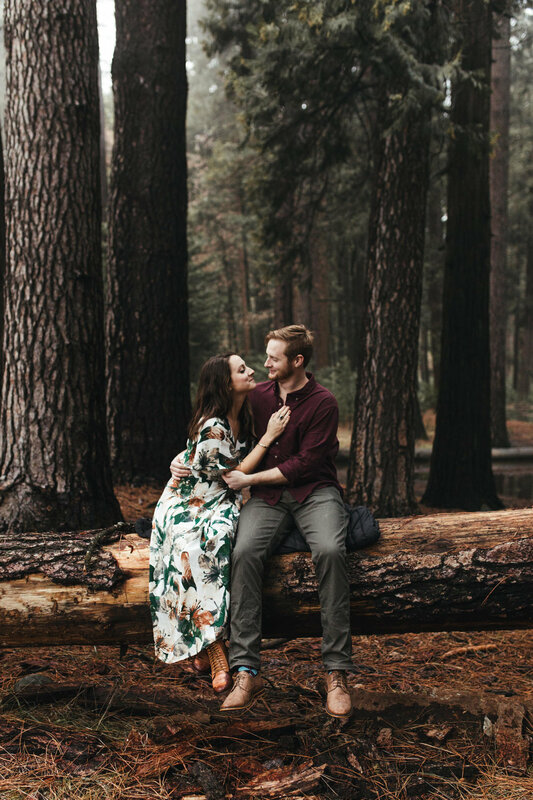 When Maddy first contacted me about shooting her + Robbie's engagement photos, she wasn't set on any one location but mentioned they were willing to travel and wanted to go somewhere beautiful, preferably with big trees. We knew we'd be near the west coast in February (when they wanted to shoot) and luckily for us, the west coast has about a billion beautiful places with big trees! We talked about going somewhere in Oregon or Washington, or one of the many National Forests in California, but ultimately landed on Yosemite National Park because, honestly, no place in the world could compare to it's striking beauty and versatile landscapes! Plus, Maddy had never been and I think everyone needs to experience Yosemite at some point (preferably many points) in their life! In the weeks leading up to and even the day before the session, the forecast looked horrible (cold and rainy, but not cold enough to snow) and we considered re-locating a few times, but the valley is so unpredictable and I knew we could make something gorgeous happen no matter the weather, so we stuck to the plans. Thankfully and not suprisingly - Yosemite didn't fail us! 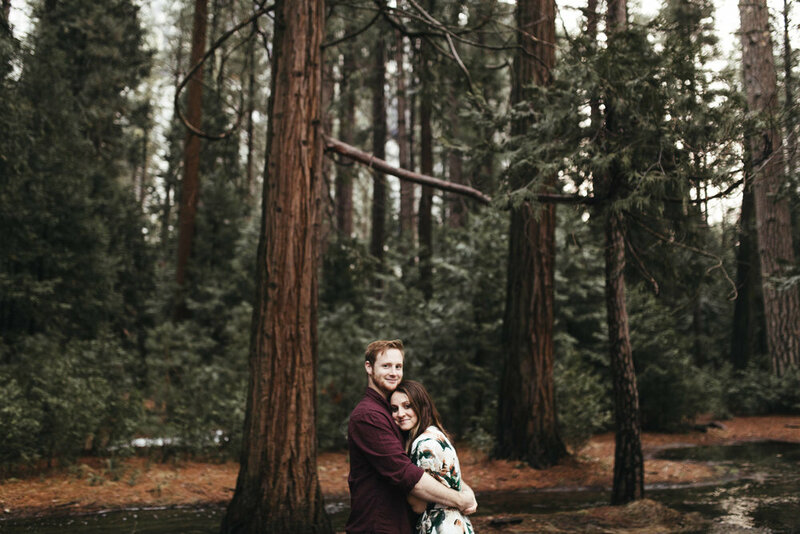 Maddy and Robbie met us at the lodge around lunch time and we spent the afternoon exploring the park; hiking to waterfalls, crossing creeks on fallen trees, taking in the epic views from up above the valley, and walking through snowy meadows below Yosemite's most famous features. 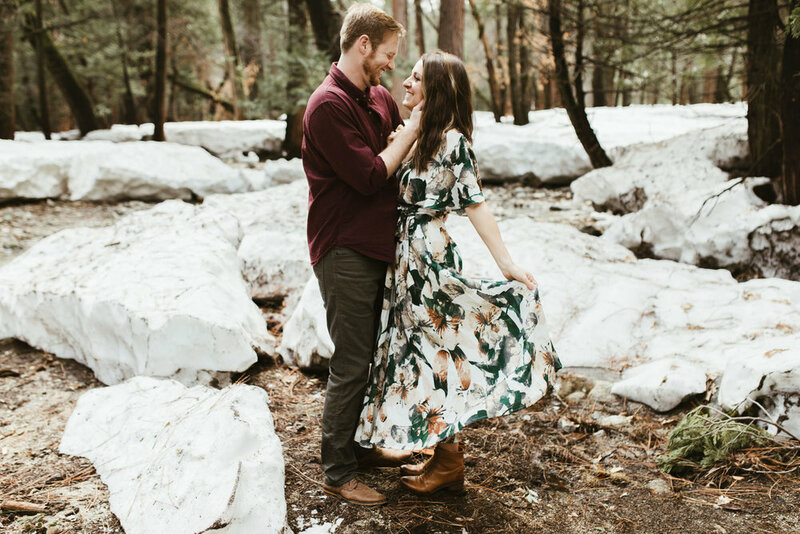 Maddy + Robbie were totally game for the adventurous side of the session, like trudging through snow, getting sprayed by bridal veil fall, and even scaling a 6 foot rock wall (yes - Maddy did that IN A DRESS and boots with heels!!) like total bosses. While the scenery was absolutely stunning, nothing could compare to the sweet, tender, and excited love these two shared. We loved watching them get comfortable in front of the camera and show off their goofy personalities. I always say this, but it's because I truly mean it, we are so thankful to have made two new friends through this engagement session! I love that Maddy trusted us to choose a location and be there with her for her first experience in Yosemite National Park. I'm certain she'll agree when I say it definitely did not disappoint!